P has spent much of the last three weeks on the road, or rather in the air, traveling across the US. And while he normally asks for (and gets) an aisle seat, there were a couple of times when he sat by the window. 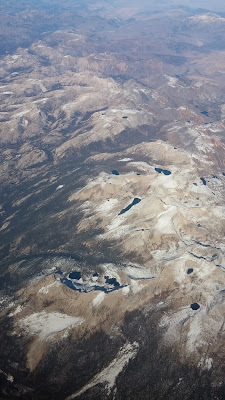 This last trip, on Sunday, took him from Chicago to SFO, and flew right over the top of the northern part of Yosemite, from the north shore of Mono Lake to Hetch-hetchy. He couldn't resist getting out his camera and taking a few photos. If you want more detail, click on the photo and use the zoom option on Picasa. 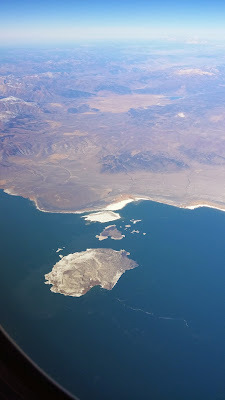 The first one is of Mono Lake and its islands. Then a shot of Young Lakes, McCabe Lakes, Mt. 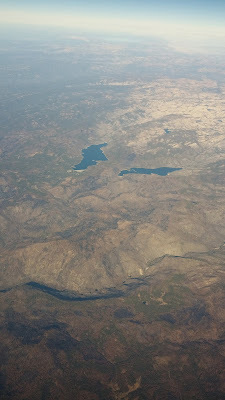 Conness, and Virginia Canyon, with Soldier and Return Lakes above it. 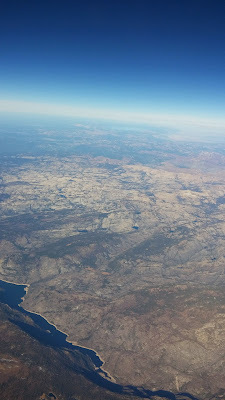 And then a shot of Hetch-hetchy that shows Laurel Lake and Lake Vernon, where the Rim Fire appears to be finally and totally out. No smoke at all. Finally, Lake Eleanor and Cherry Lake, showing a lot of the damage from the Rim Fire.